Silver It-Girl pendant - Silver pendants for It-Girls! 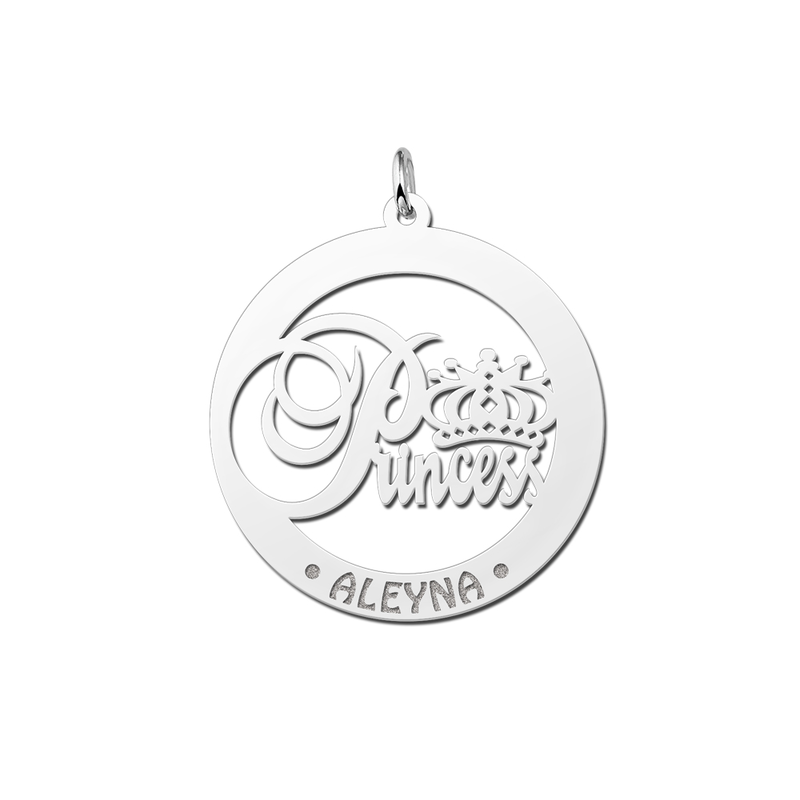 All sweet little girls who love crowns deserve a trendy silver pendant with their very own name! 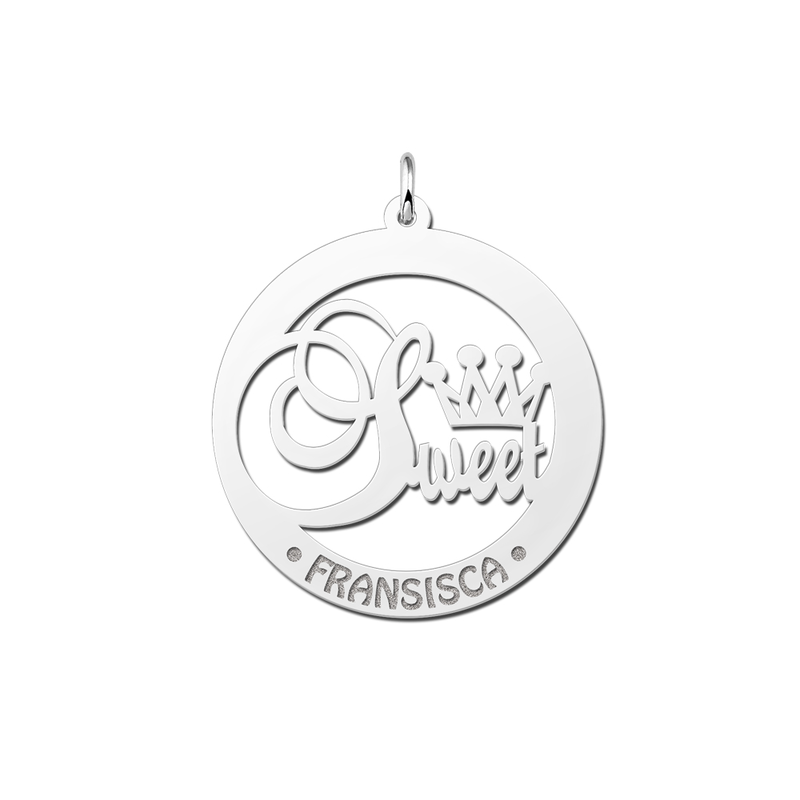 Whether you are an angel or a princess, with our trendy coin pendant you will really steal the show! The big pendants are round and you can choose from several types. We have Angel, Princess, Sweet and Famous pendants for all little angels, little princesses, sweet little girls and famous little women. And of course we engrave the name of the little angel or the little princess on them! 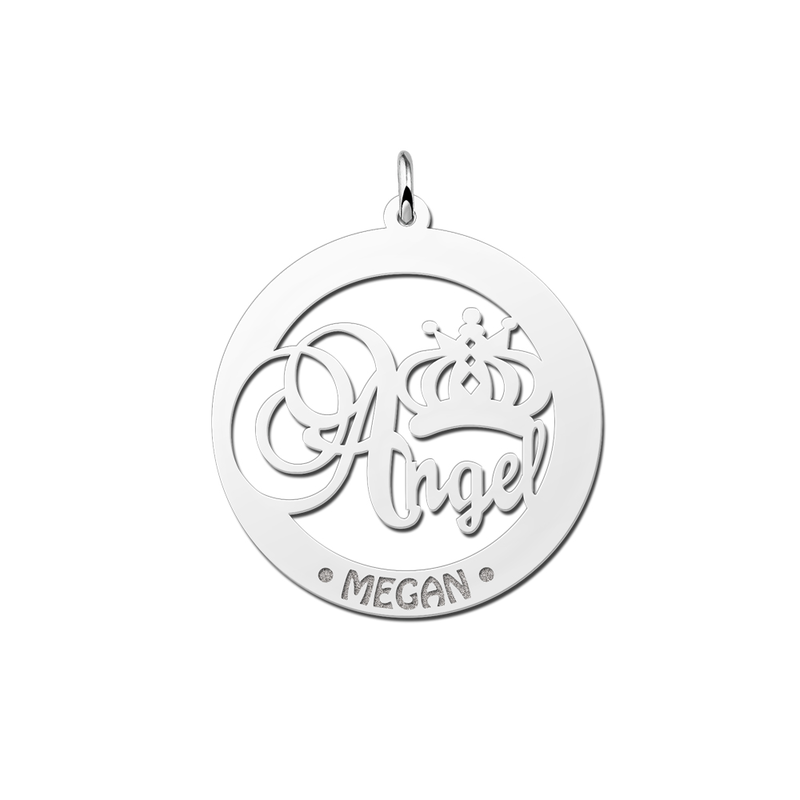 Our Angel XL pendant, topped with a crown, was designed for all little angels. If your daughter is a real angel, then choose this silver pendant for her! This oversized pendant comes in a round shape and we engrave the name of your daughter, granddaughter, niece or the little girl next door on it. Is your daughter a real princess? Then our trendy Princess XL pendant really must be part of your daughter’s outfit! She will shine like a princess with her trendy oversized silver pendant with her own name on it! And of course the big round pendant also shows a crown for a real princess. Do you have a daughter who is very sweet and do you want to let the world know? Give her our trendy Sweet XL pendant, complete with crown! She will make a great impression on her friends with this darling, trendy pendant. Our big round oversized pendant shows the name of your sweet little girl, your granddaughter, your niece, or the girl next door. Does your daughter or granddaughter want to be famous? Does she admire all the stars? For you she is already famous! 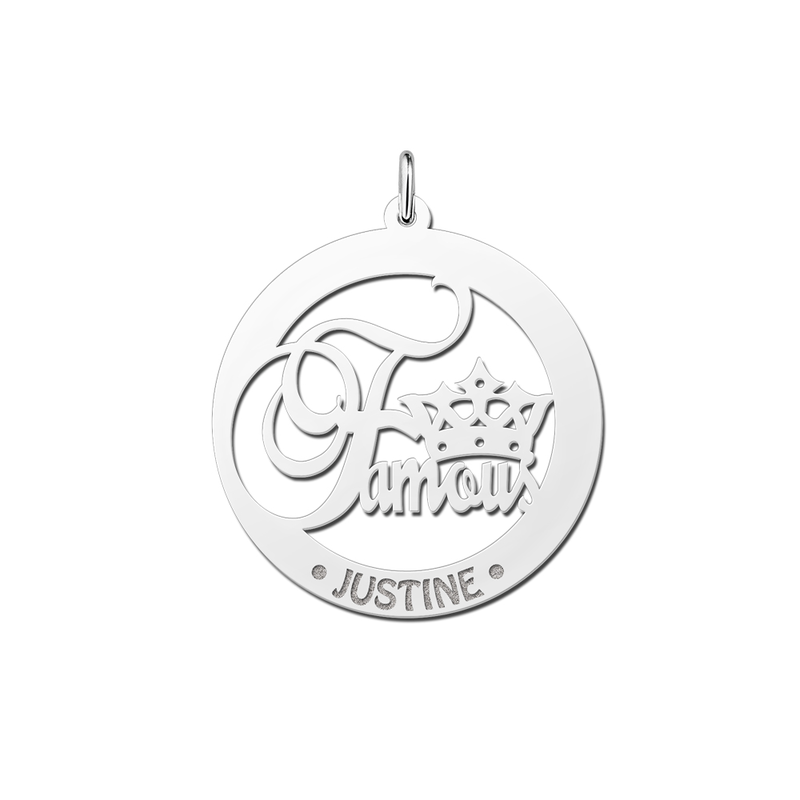 You can let her know with this trendy Famous silver pendant, complete with a crown. She will feel so special with a beautiful and modern Famous coin pendant all her own. We will engrave her name on it, so that she feels truly famous with her own personalised XL pendant. Needless to say, our silver pendant is fashionably oversized and round. Surprise your daughter, the girl next door, your niece or your daughter’s girlfriend! Our Angel, Princess, Sweet and Famous oversized pendants are the ideal gift, one that every girl will love. Give one of these t trendy silver pendants to your daughter, the girl next door, your niece or your daughter’s girlfriend and they will be tickled pink. And when they see their own name on the silver charm, they will be even more pleased with your present. Our XL pendants are also very suitable as communion gifts. Not all girls have a trendy long necklace. So make your gift complete with a matching long necklace. The trendy silver necklace is made of lovely fantasy links and is 80 cm long. We make trendy XL pendants and other pendants and charms of a particularly high grade of silver, the kind you also find at a jeweller’s. If you buy your jewellery from us online, it’s just like you made a special trip to the jeweller’s to buy a gift. And it’s so easy, right from your own living room! You won’t need to wait very long! Your personal trendy silver pendant is ready and your order leaves our studio within four working days. Depending on the postal service, you will receive your order another& 5-8 days later. We do not charge you any shipping costs! We deliver trendy silver oversized pendants, with or without a necklace, of very good quality, comparable to the quality supplied by jewellers. All our jewellery is beautifully finished and is meant to be shown off! So browse our site and order your silver name XL pendant today – from us, your specialist in name jewellery!